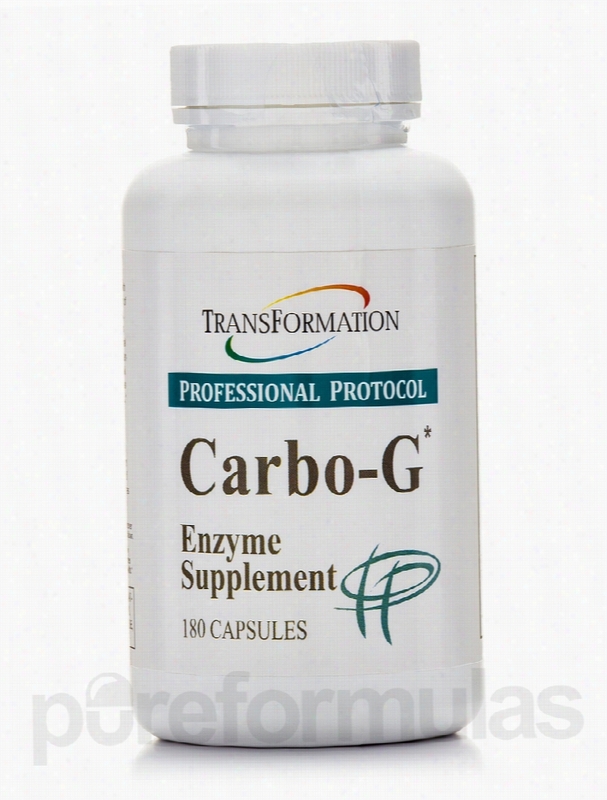 Transformation Enzyme Corporation Metabolic Support - Carbo-G - 180. Support a gluten-free lifestyle with Carbo-G&sbquo; a digestive enzyme supplement from Transformation Enzyme Corporation. Carbo-G features an enzyme blend (as well as an herbal blend) formulated to possibly help your body digest gluten and carbohydrates. Some of the ingredients that may help Carbo-G do that are: Phytase This type of enzyme supplement can potentially breakdown phytic acid&sbquo; a substance normally found in grains that is indigestible. Alpha-Galactosidase Carbo-G is formulated with this enzyme supplement because it is responsible for the break down and digestion of glycolipids and glycoproteins&sbquo; fats and proteins that feature an attached carbohydrate molecule. Bifidobacterium Infantis This probiotic helps regulate the normal and healthy levels of goo bacteria in our intestines. As such&sbquo; they are often used as a supplement to possibly help alleviate symptoms of certain intestinal issues. These &quot;good&quot; bacteria serve as Essential role in our body by helping our body break down foods and absorb nutrients&sbquo; while making sure &quot;bad&quot; bacteria don't take over. Amylase&sbquo; Lipase&sbquo; &amp; Protease These three enzymes make up what is called Pancreatin&sbquo; an enzyme mixture made in the pancreas. Amylase is present in the saliva of our mouths and begins the digestion process by catalyzing the break down of starches into sugars. Lipase begins the break down of fats (lipids) and protease is responsible for digesting proteins by breaking the peptide bonds the hold amino acids together. Herbal Blend Transformation Enzyme Corporation's Lypo also includes an Herbal Blend to promote general gastrointestinal health. It features Flax Seeds&sbquo; Ginger&sbquo; Artichoke Leaves&sbquo; and Peppermint Leaf. Since its founding in 1991&sbquo; Transformation Enzyme Corporation (TEC) has believed that you should be able to enjoy a healthy and happy lifestyle. Since then&sbquo; TEC has been providing nutritional supplements that allow people around the world to maintain their health in the most convenient way possible. These statements have not been evaluated by the Food and Drug Administration (FDA). These products are not meant to diagnoseÃ¢ÂÂ treat or cure any disease or medical condition. Please consult your doctor before starting any exercise or nutritional supplement program or before using these or any product during pregnancy or if you have a serious medical condition. Transformation Enzyme Corporation Metabolic Support - Digest - 90. Sometimes people don't realize how important proper nutrient absorption is when trying to live a healthy lifestyle. Certain factors like genetics&sbquo; poor diet&sbquo; a stressful lifestyle&sbquo; and more could possibly influence your digestion&sbquo; which would then affect your nutrient absorption from food. 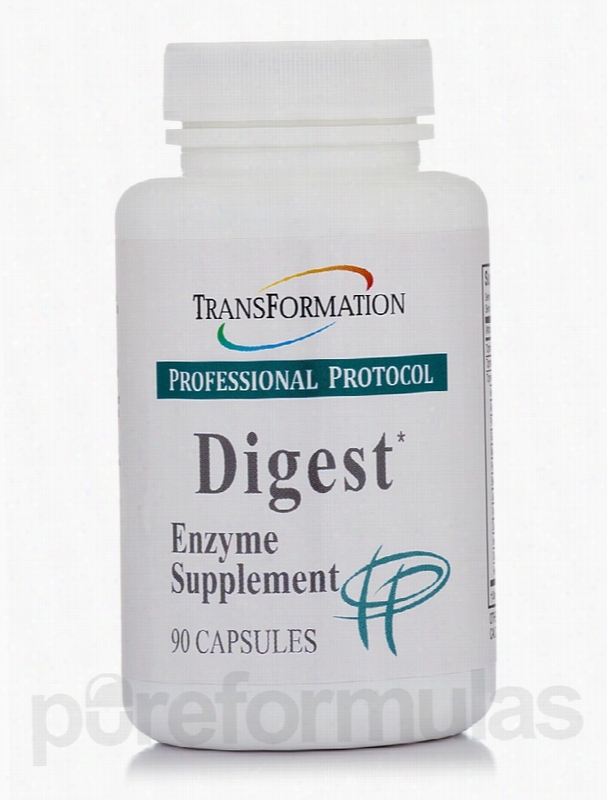 In order to possibly help support healthy digestion&sbquo; Transformation Enzyme Corporation's Digest is formulated with digestive enzymes that could potentially help with the digestion and absorption of various foods and nutrients. Enzymes are molecules that aid in the metabolization (digestion) of various foods by lowering the activation energy needed for digestion. In essence&sbquo; enzymes could potentially make it easier for your Body to absorb nutrients from the foods we eat. For instance&sbquo; Digest features an enzyme called Lipase. This enzyme is responsible for initializing the process of breaking down fats (lipids). Additionally&sbquo; Digest also features Protease&sbquo; an enzyme that is able to being the breaking down process for proteins. This is possible because protein are composed of amino acids. These amino acids are held together by peptide bonds. Protease is able to dismantle these bonds and break the amino acids apart&sbquo; allowing the protein to be digested. Another enzyme in Digest is Invertase&sbquo; an enzyme that aids in the breaking down of sucrose (common sugar). The pancreatic enzyme&sbquo; amylase&sbquo; is also formulated into Digest. Amylase is present in our saliva and is often the first step in the process of digestion. Once food comes into contact with the saliva in our mouths&sbquo; amylase is responsible fo starting the process of turning starches into sugars. Other digestive enzymes include Glucoamylase&sbquo; Cellulase&sbquo; Diastase&sbquo; and more. Since its founding in 1991&sbquo; Transformation Enzyme Corporation (TEC) has believed that you should be able to enjoy a healthy and happy lifestyle. Since then&sbquo; TEC has been providing nutritional supplements that allow people around the world to maintain their health in the most convenient way possible. These statements have not been evaluated by the Food and Drug Administration (FDA). These products are not meant to diagnoseÃ¢ÂÂ treat or cure any disease or medical condition. Please consult your doctor before starting any exercise or nutritional supplement program or before using these or any product during pregnancy or if you have a serious medical condition. 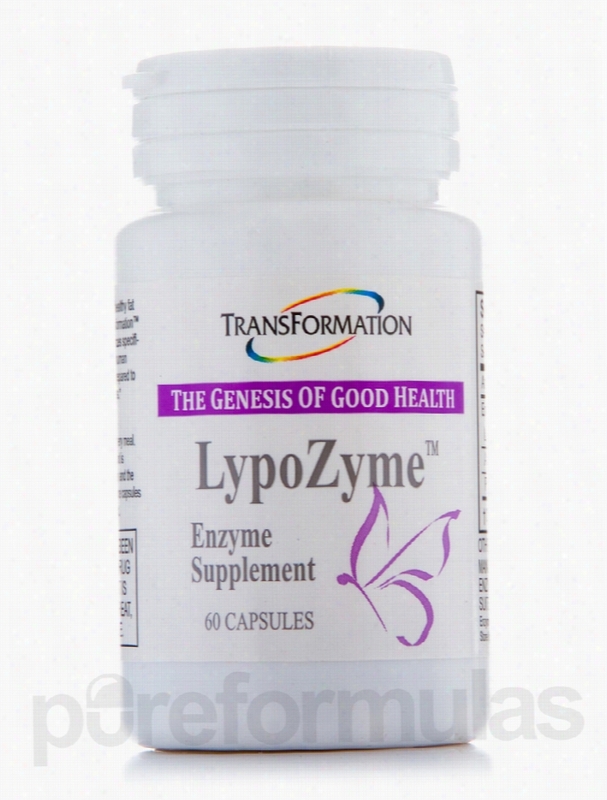 Transformation Enzyme Corporation Immune Support - LypoZyme - 60. Transformation Enzyme Corporation Metabolic Support - Digest - 60. If you're looking to live a more nutritious lifestyle&sbquo; sometimes merely eating healthy isn't enough. The key is absorbing those key nutrients in the healthy foods you eat&sbquo; which is where a healthy digestion system comes into play. Sometimes stressful lifestyles&sbquo; processed foods&sbquo; and other factors could possibly affect your digestive system&sbquo; which affects nutrient absorption. That's why Transformation Enzyme Corporation has created Digest&sbquo; their blend of digestive enzymes formulated to aid in the digestion of certain foods in our diet. The way enzymes work is they aid Metabolic processes in our body which break down the food we eat and absorb the nutrients within them. For example&sbquo; one of the enzymes found in Digest is Amylase. This enzyme is found in our mouths&sbquo; specifically in our saliva. Once food enters the mouth and is chewed&sbquo; it is exposed to amylase&sbquo; which is responsible for starting the metabolic process that breaks down starches into sugars&sbquo; making their digestion easier. Another enzyme featured in this enzyme supplement is Alpha-galactosidase. This enzyme plays the role of catalyzing the breakdown of glycolipids and glycoproteins&sbquo; fats and proteins that have an attached carbohydrate molecule. Digest also has Lactase&sbquo; an enzyme that is chiefly present in infants. Lactase is responsible for playing a role in the digestion of sugars in whole milk and dairy products. However&sbquo; as we age the levels of lactose could drastically drop&sbquo; possibly making the digestion of milk and dairy products difficult. 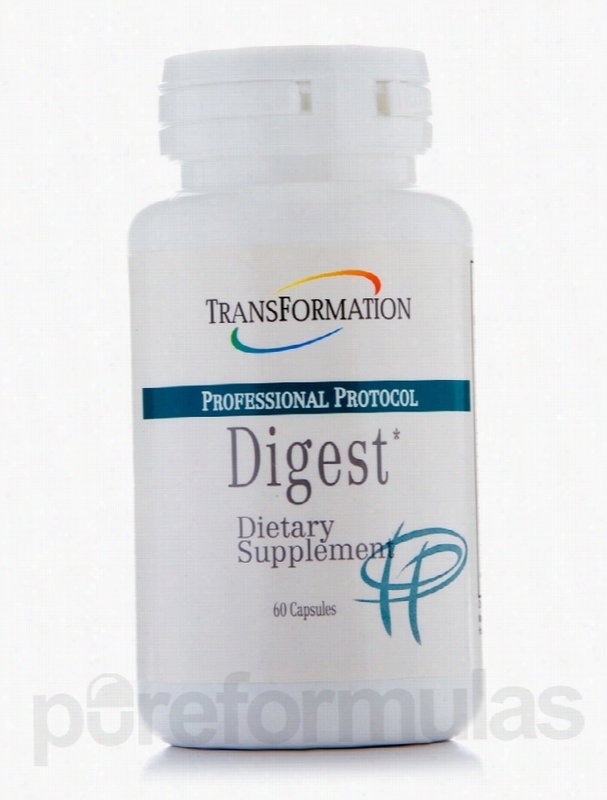 Digest from Transformation Enzyme Corporation also features Pectinase&sbquo; Phytase&sbquo; Lipase&sbquo; Glycoamylase&sbquo; &sbquo;Protease&sbquo; Cellulase&sbquo; and other digestive enzymes thought could potentially improve your overall digestive health. Since its founding in 1991&sbquo; Transformation Enzyme Corporation (TEC) has believed that you should be able to enjoy a healthy and happy lifestyle. Since then&sbquo; TEC has been providing nutritional supplements that allow people around the world to maintain their health in the most convenient way possible. These statements have not been evaluated by the Food and Drug Administration (FDA). These products are not meant to diagnoseÃ¢ÂÂ treat or cure any disease or medical condition. Please consult your doctor before starting any exercise or nutritional supplement program or before using these or any product during pregnancy or if you have a serious medical condition. 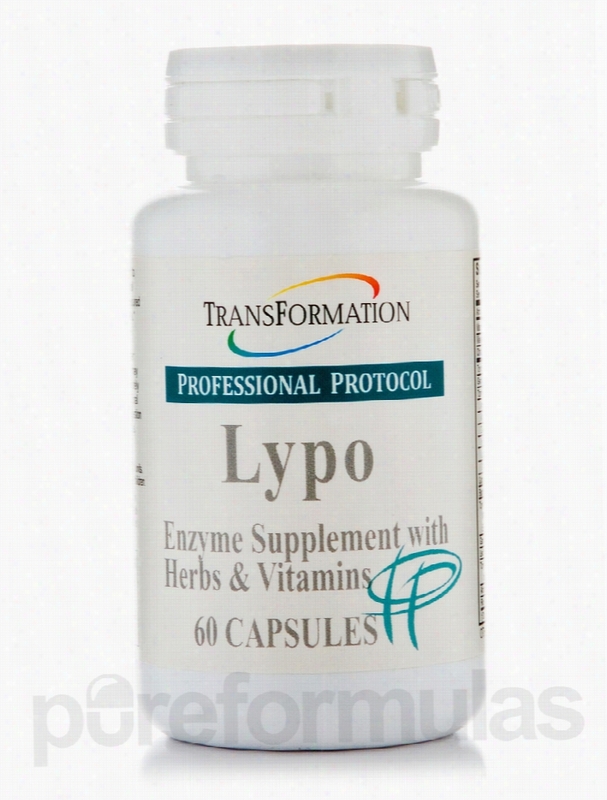 transformation Enzyme Corporation Cardiovascular Support - Lypo - 60. There's no getting around it&sbquo; these days our diets are laden with high-fat and high-cholesterol foods&sbquo; especially when you're working and need to eat something quick. The easiest and fastest foods to obtain are generally high in fat. Looking to possibly change that? In addition to some changes in your diet&sbquo; Lypo&sbquo; a digestive enzyme supplement by Transformation Enzyme Corporation&sbquo; is formulated with herbs&sbquo; vitamins&sbquo; enzymes&sbquo; and more to maintain healthy blood-lipid levels and the digestion of fats. Some of the key ingredients include: Garcinia Cambogia Fruit Extract Culinary applications aside&sbquo; this plant featured in Lypo has gained a lot of attention recently due to claims that it may promote weight loss due to the presence of HCA (hydroxycitric acid). HCA has been suggested by some to inhibit the metabolization of fats from carbohydrates&sbquo; possibly stinting the generation of bad cholesterol (LDL) as triglycerides (fat in the blood). It has also been suggested that the garcinia cambogia fruit extract in Lypo may increase serotonin levels&sbquo; which some people feel can help you lose weight by deterring emotional and reactive eating. Lipase Lypo is formulated with this enzyme because it catalyzes (begins) the hydrolysis (breakdown) of lipids (fats). Guggulipid Standardized Extract Derived from the tree bark of the commiphora mukul tree in India&sbquo; this extract has been suggested by some to possibly help lower cholesterol levels in the Body. It may also have an effect on triglycerides. Alpha-Galactosidase This enzyme is featured in Lypo because it potentially breaks down glycolipids and glycoproteins&sbquo; fat and protein molecules with carbohydrates attached to them. Since its founding in 1991&sbquo; Transformation Enzyme Corporation (TEC) has believed that you should be able to enjoy a healthy and happy lifestyle. Since then&sbquo; TEC has been providing nutritional supplements that allow people around the world to maintain their health in the most convenient way possible. These statements have not been evaluated by the Food and Drug Administration (FDA). These products are not meant to diagnoseÃ¢ÂÂ treat or cure any disease or medical condition. Please consult your doctor before starting any exercise or nutritional supplement program or before using these or any product during pregnancy or if you have a serious medical condition. Transformation Enzyme Corporation Metabolic Support - Powdered. In order to fully benefit from a healthy diet&sbquo; an efficient and effective digestive system is a must. If the digestive enzymes&mdash;chemicals responsible for catalyzing the breaking down process for various types of food&mdash;in your digestive tract are insufficient or operating ineffectively&sbquo; the range of nutrients in the food you eat won&rsquo;t be fully absorbed by your body; instead&sbquo; they may ultimately pass out as waste material. As a result&sbquo; it is potentially possible that a severe lack of nutrient absorption may put an individual at risk for a vitamin or mineral deficiency. This then could lead to a wide variety of unwanted and unpleasant conditions. 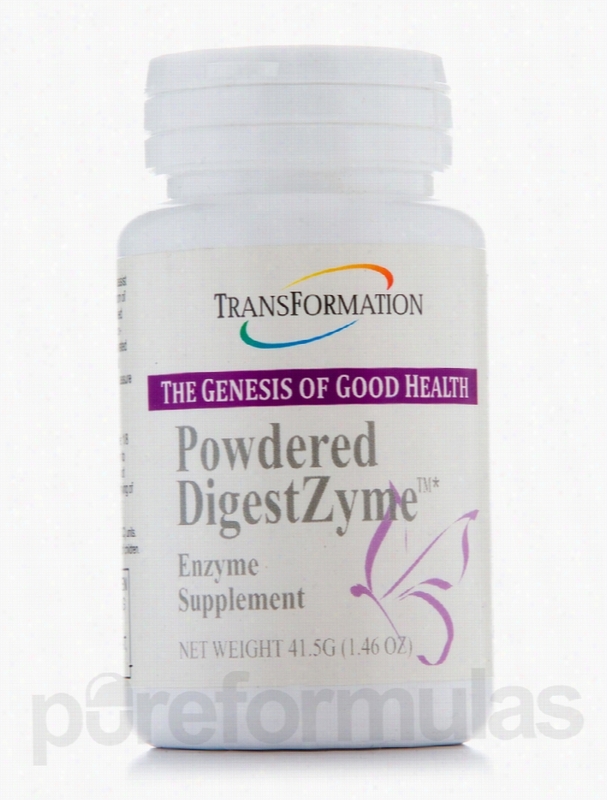 Transformation Enzyme Corporation&rsquo;s Powdered DigestZyme is a uniquely formulated digestive enzyme supplement designed to aid the body in achieving maximum digestion and absorption of nutrients&sbquo; help foster the production of energy&sbquo; and increase the effectiveness of your immune system. When combined with a healthy diet and lifestyle&sbquo; DigestZyme may help increase the efficiency with which your digestive system does its job. This powder contains a blend of polysaccharolytic enzymes that support digestion; this blend includes amylase for breaking down starches&sbquo; protease for digesting protein&sbquo; and lipase for digestion of fats. Powdered DigestZyme also helps relieve symptoms of food intolerance&sbquo; as well as regular gas pains and stomach cramps. These high-quality enzymes are cultivated in a way that increases their bioavailability. Each Container of Powdered DigestZyme by Transformation Enzyme Corporation provides nearly one-and-a-half ounces&sbquo; which is enough to last for roughly two months at the recommended serving size. Since its founding in 1991&sbquo; Transformation Enzyme Corporation (TEC) has believed that you should be able to enjoy a healthy and happy lifestyle. Since then&sbquo; TEC has been providing nutritional supplements that allow people around the world to maintain their health in the most convenient way possible. These statements have not been evaluated by the Food and Drug Administration (FDA). These products are not meant to diagnoseÃ¢ÂÂ treat or cure any disease or medical condition. Please consult your doctor before starting any exercise or nutritional supplement program or before using these or any product during pregnancy or if you have a serious medical condition. Transformation Enzyme Corporation Hormone/Glandular Support -. 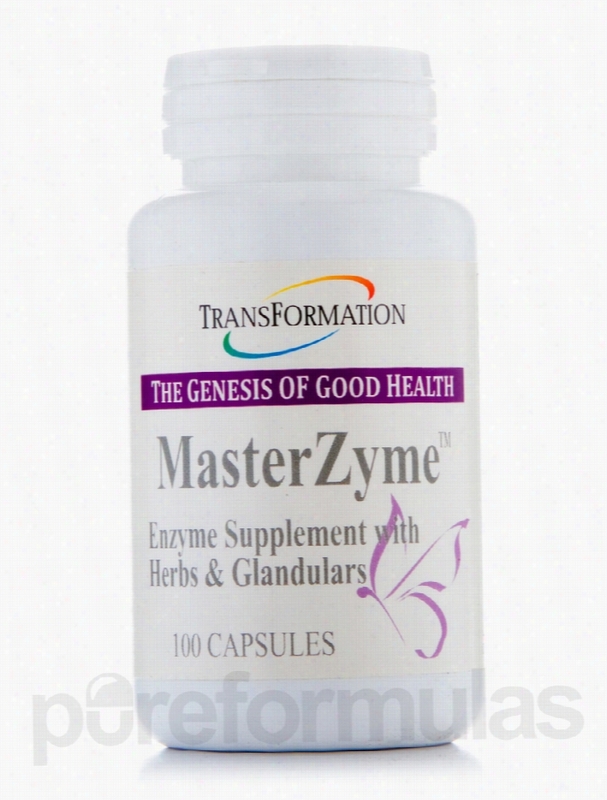 Possibly support glandular health for your endocrine system with MasterZyme by Transformation Enzyme Corporation. The body's endocrine system is composed of different glands that each produce different hormones that serve different purposes. These glands include the hypothalamus&sbquo; pituitary&sbquo; thyroid&sbquo; kidney&sbquo; adrenal&sbquo; plus more. In order to possibly help maintain a healthy functioning endocrine system&sbquo; MasterZyme has been formulated with a wide variety of ingredients. Thyroid&sbquo; Suprarenal Cortex&sbquo; &amp; Anterior Pituitary Concentrate The theory of using organs or glands similar to that of humans to help maintain respective organ or gland health within ourselves is call glandular therapy (or organotherapy). That's why Transformation Enzyme Corporation's endocrine supplement&sbquo; MasterZyme&sbquo; is formulated with thyroid&sbquo; suprarenal&sbquo; and pituitary concentrate&sbquo; to help support thyroid&sbquo; adrenal&sbquo; and pituitary health. Parsley Leaf In addition to its culinary uses&sbquo; it's possible that parsley can alleviate certain gastrointestinal and kidney issues. It can also be used to possibly promote urination&sbquo; induce appetite&sbquo; improve digestion&sbquo; and more. Amylase&sbquo; Lipase&sbquo; Protease These three enzymes comprise what is called Pancreatin&sbquo; an enzyme mixture synthesized in the pancreas. All three enzymes serve a different function in the digestion process. For instance&sbquo; amylase is an enzyme present in the saliva of our mouth. As we chew food it is exposed to amylase&sbquo; which turns starches into sugars&sbquo; acting as the the first step in the digestion process. Lipase is an enzyme that catalyzes (or begins) the process of digesting fats in the food we eat. Protease&sbquo; on the other hand&sbquo; plays the integral role of breaking down proteins. This is accomplished by dismantling the peptide bonds that hold amino acids together&sbquo; allowing the proteins to broken down. Since its founding in 1991&sbquo; Transformation Enzyme Corporation (TEC) has believed that you should be able to enjoy a healthy and happy lifestyle. Since then&sbquo; TEC has been providing nutritional supplements that allow people around the world to maintain their health in the most convenient way possible. These statements have not been evaluated by the Food and Drug Administration (FDA). These Products are not meant to diagnoseÃ¢ÂÂ treat or cure any disease or medical condition. Please consult your doctor before starting any exercise or nutritional supplement program or before using these or any product during pregnancy or if you have a serious medical condition. Transformation Enzyme Corporation Metabolic Support - BalanceZyme Plus. Managing your weight with a sensible is often easier said than done. Maintenance often involves uphill challenges&sbquo; slips&sbquo; and falls before getting on a path to success. The best way to stay healthy is with a nutritious diet and regular exercise&sbquo; but various factors can make these difficult to achieve. Two of the most common frustrations are not feeling full after a meal and lack of motivation. Certain supplements may help promote your body&rsquo;s digestion of fats&sbquo; while supporting a healthy appetite. 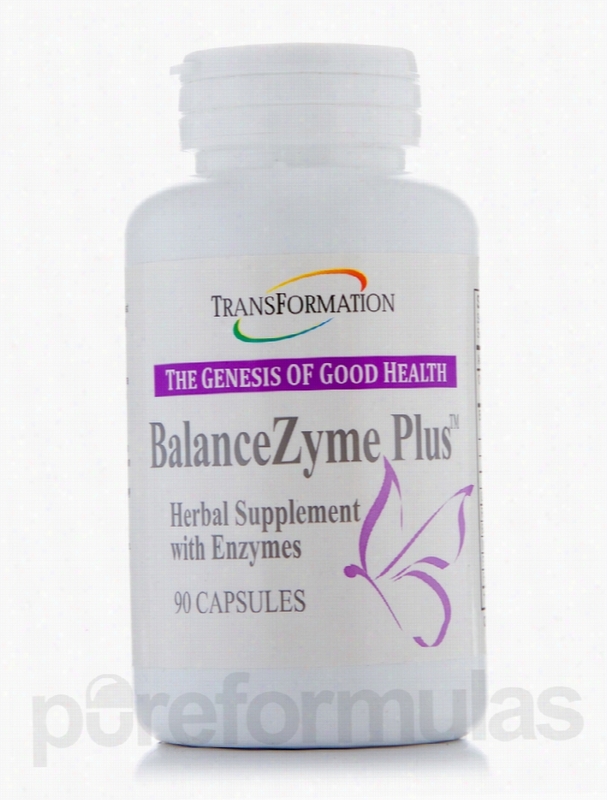 Transformation Enzyme Corporation&rsquo;s BalanceZyme Plus is a natural product. It contains selected herbal extracts formulated with an enzyme blend for the effective delivery of nutrients into your cells. Enzymes are active biological molecules important to thousands of life-sustaining chemical conversions. These capsules may be an authentic source of support for the endocrine system&mdash;which works to regulate your metabolism&mdash;and the digestive system. Ingredients include: Garcinia cambogia (fruit) extract Plantain leaf Bladderwrack algae&sbquo; prickly ash&sbquo; and fenugreek&mdash;provide natural support for digestion&sbquo; the liver&sbquo; and the pancreas&sbquo; an organ that regulates insulin and sugar absorption while breaking down dietary fats Stinging nettle and chromium&mdash;help you maintain already normal blood sugar levels Protease&sbquo; lipase&sbquo; amylase&sbquo; and cellulase (combined as an enzyme blend)&mdash;encourage digestion and a healthy appetite BalanceZyme Plus by Transformation Enzyme Corporation contains 90 capsules per bottle&sbquo; which is intended to last for about one month. The recommended dosage is one tablet with each meal&sbquo; unless otherwise directed by a health care professional. This diet supplement may be able to support overall health as part of a weight management program that involves consuming nutritious foods and exercise. Since its founding in 1991&sbquo; Transformation Enzyme Corporation (TEC) has believed that you should be able to enjoy a healthy and happy lifestyle. Since then&sbquo; TEC has been providing nutritional supplements that allow people around the world to maintain their health in the most convenient way possible. These statements have not been evaluated by the Food and Drug Administration (FDA). These Products are not meant to diagnoseÃ¢ÂÂ treat or cure any disease or medical condition. Please consult your doctor before starting any exercise or nutritional supplement program or before using these or any product during pregnancy or if you have a serious medical condition. 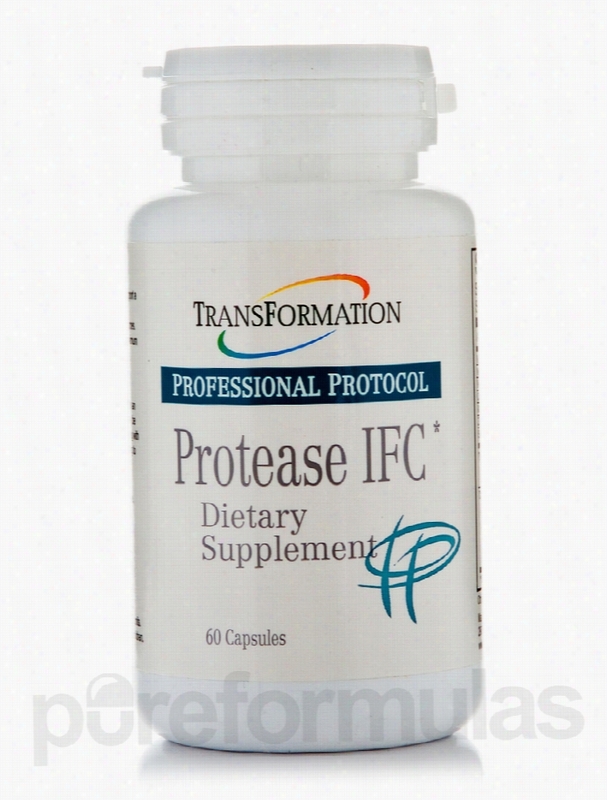 Transformation Enzyme Corporation Cellular Support - Protease IFC - 60. Make Protease IFC a part of your after workout routine. Featuring a blend of enzymes&sbquo; vitamins&sbquo; and minerals&sbquo; this proteolytic enzyme supplement is formulated to possibly help mitigate muscle pain and oxidative stress&sbquo; especially after an intense workout. Some of the key ingredients in Protease IFC are: Vitamin C This essential vitamin's role extends far beyond its potential Immune boosting benefits. Protease IFC features vitamin C because research and scientific studies have suggested that maintaining healthy vitamin C levels could possibly help alleviate symptoms of muscle fatigue. Selenium A deficiency in selenium&sbquo; an essential mineral&sbquo; has been possibly linked with with dysfunctional skeletal and cardiac muscles. To help support these muscles&sbquo; Protease IFC has been formulated to help individuals maintain healthy selenium levels. Tyzyme&trade; Protease Blend A combination of the protease enzymes Bromelain &amp; Papain. Bromelain is derived from pineapples. It has been suggested by some that bromelain might feature some muscular benefits such as promoting muscle contractions&sbquo; relaxing muscles&sbquo; and (most relevant for Protease IFC) the possible reduction of sore muscles after an intense workout. Papain is also derived from a fruit&sbquo; papaya to be exact. Like most proteolytic enzymes&sbquo; papain helps in the metabolization of proteins&sbquo; by dismantling the peptide bonds that hold amino acids together. Antioxidants Protease IFC is formulated with Tyzyme&trade; AntiOx Blend&sbquo; a blend of botanicals and other ingredients to offer potential antioxidant support. Antioxidants are believed to eliminate free radicals within our body. Free radicals are atoms that have uncompleted electron bonds&sbquo; which could potentially cause health problems depending on where they are located. Some of the ingredients in Protease IFC's Tyzyme&trade; AntiOx Blend include Grape Seed Extract&sbquo; Tumeric&sbquo; Asian Ginseng&sbquo; Gingko Biloba Leaf&sbquo; and much more. Give your body's muscle the support they deserve with Transformation Enzyme Corporation's Protease IFC. Since its founding in 1991&sbquo; Transformation Enzyme Corporation (TEC) has believed that you should be able to enjoy a healthy and happy lifestyle. Since then&sbquo; TEC has been providing nutritional supplements that allow people around the world to maintain their health in the most convenient way possible. These statements have not been evaluated by the Food and Drug Administration (FDA). These products are not meant to diagnoseÃ¢ÂÂ treat or cure any disease or medical condition. Please consult your doctor before starting any exercise or nutritional supplement program or before using these or any product during pregnancy or if you have a serious medical condition. Transformation Enzyme Corporation Gastrointestinal/Digestive -. Your body uses molecules called enzymes to encourage your cells to work more efficiently. Enzymes speed up the chemical reactions within your body&sbquo; such as digestion&sbquo; that happen inside your cells. When you eat foods that contain protein&sbquo; an enzyme called protease helps break the protein down so that your body can use it to make new cells&sbquo; fix damaged cells&sbquo; and promote growth. Your body makes its own supply of protease&sbquo; but sometimes doesn&rsquo;t produce enough of it. If this happens&sbquo; you can end up with indigestion and other digestive problems. When your body can&rsquo;t digest protein on a long-term basis&sbquo; it can weaken your immune system&sbquo; make it tougher for your liver to work properly&sbquo; cause fatigue&sbquo; and weaken your muscles. 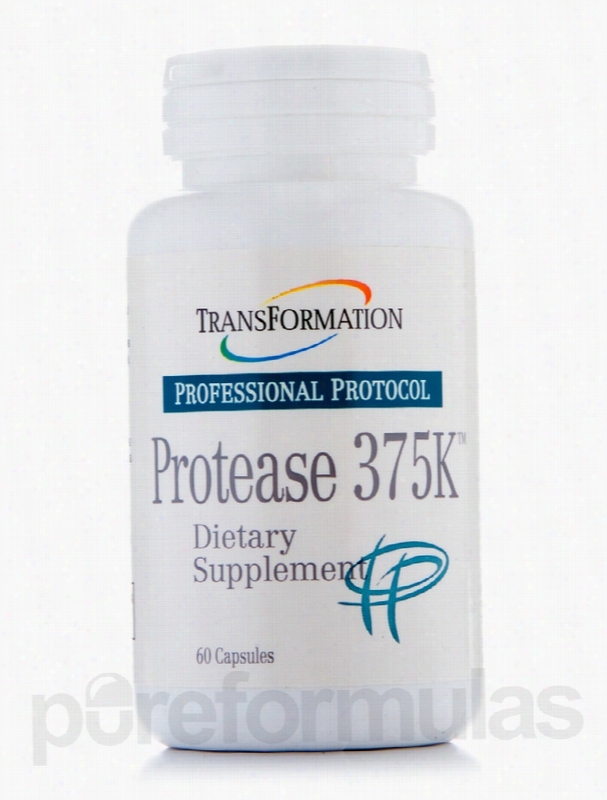 Transformation Enzyme Corporation&rsquo;s Protease 375K gives your body the protease it needs to ensure proper digestion. The only active ingredient in this supplement is a protease blend full of enzymes that break down the proteins you eat. Unlike some other protease supplements&sbquo; Protease 375K doesn&rsquo;t contain either bromelain (pineapple) or papain (papaya) extracts. It also doesn&rsquo;t have any calcium. Therefore&sbquo; you can take these capsules safely&sbquo; even if you have intolerance to either of these extracts or need to limit your calcium intake. One bottle of Protease 375K by Transformation Enzyme Corporation provides a two-month supply if one capsule is taken daily&sbquo; and a one-month supply if you take two capsules per day; the recommended dosage may depend on your physician&rsquo;s advice. These supplements work best when you take them right before meals. Since its founding in 1991&sbquo; Transformation Enzyme Corporation (TEC) has believed that you should be able to enjoy a healthy and happy lifestyle. Since then&sbquo; TEC has been providing Nutritional supplements that allow people around the world to maintain their health in the most convenient way possible. These statements have not been evaluated by the Food and Drug Administration (FDA). These products are not meant to diagnoseÃ¢ÂÂ treat or cure any disease or medical condition. Please consult your doctor before starting any exercise or nutritional supplement program or before using these or any product during pregnancy or if you have a serious medical condition.